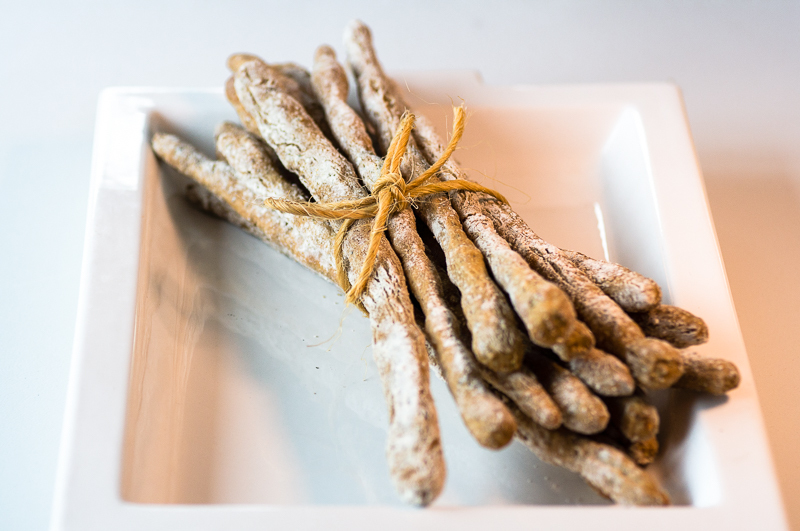 Fresh breadsticks are a very versatile and beautiful accompaniment to any meal. The multigrain flour gives a wonderfully nutty flavour and a delicious bite to the breadsticks. The Saltverk Flaky Sea Salt offers a wonderful tang to these and is a great foil for cured meats and cheeses. Place all the ingredients in a large bowl and mix until combined. Tip out onto a work surface and knead and stretch for 10 mins or so until smooth. Do not be tempted to add more flour, it will be a little messy to begin with but the dough should begin to come together soon enough. A dough scraper may come in handy! Place the dough in a clean oiled bowl and cover and leave to prove for an hour or until doubled in size. Grab a couple of baking trays and line with non-stick baking liner or dust with flour. Lightly flour the work surface and tip the dough out. Push the dough out into a rough rectangle. Using a dough scraper or knife cut a 1cm strip off the dough, the swiftly roll and stretch these into 30cm/1ft breadsticks, and place gently on the prepared baking sheets. Continue taking slices from the dough, rolling and placing until the dough is finished. Dust the breadsticks with a little flour and leave to prove. Leave the dough for 45 mins to 1 hour until puffed a little. Place the trays in the oven and bake for 12-15 mins until crisp and delicious. Leave to cool on a suitable rack then service with suitable accompaniments, or a fresh rocket pesto - whatever takes your fancy.